For #TableauTipsMonth, I wrote a blog post about How to Turn a Viz into a Poll and in doing so, gathered data from YOU, the readers, on which types of posts you want to see on our blog. It is very clear that you want to see more how-to/tutorials, resources and contests. We will keep this in mind when adding new content to the blog! 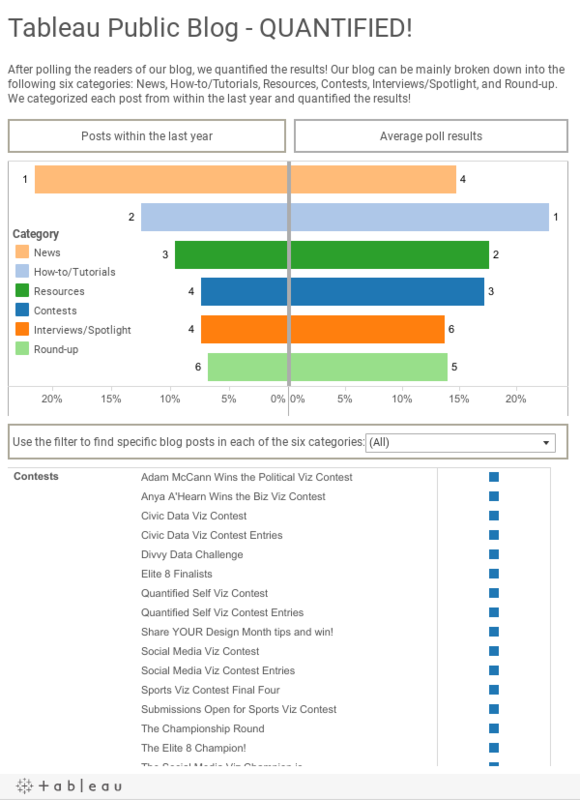 Over the last year, our Tableau Public team has published 125 blog posts from the following six categories: news, how-to/tutorials, resources, contests, interviews/spotlight, and round-up. Use the viz below to explore how our breakdown of posts compares to what the readers want to see!